Want to know what Komen Charlotte does with your donation money? Follow along with us through the end of the year to learn about our programs, grantees and community impact. Today, meet Patti. She is a breast cancer survivor and Komen Ambassador. Our ambassadors help us reach further into the community to educate women and men about breast health and breast cancer resources. They can even be called upon to help someone who has been diagnosed. They are an extension of our team and make it possible for us to reach thousands of people in our 13-county service area each year. Hello, my name is Patti. 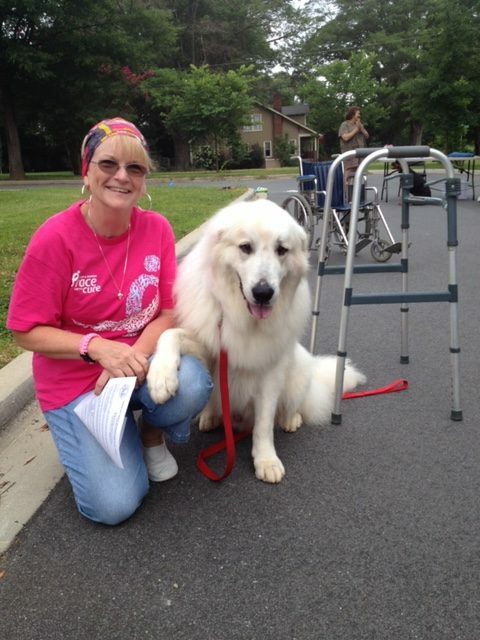 I am a Susan G. Komen Education Ambassador. I was diagnosed with Stage 1 breast cancer in April 2013 during my routine mammogram. I had surgery to remove my right breast in May 2013 and reconstruction in August 2013. I am originally from Pittsburgh, PA and did not have a real ‘support’ person in Charlotte, NC during my battle. My sister, Ginny, came to be with me throughout my recovery and surgeries, but I wanted to reach out to survivors who did not have a local support system. I was fortunate not to have chemotherapy and believed by God’s grace I survived so that I could help others. I have met so many wonderful people through Komen. I have many ‘sisters’ who are survivors and many who are struggling today with re-occurrence….they are my heroes!! So for all my friends that are heroes– I am committed to reach out and take advantage of any education opportunity to share information and hope no one has to be diagnosed but if they do….. we are here for them….. thanks to Susan G. Komen Charlotte! Help us keep our community education going by donating to #KomenCLT this year. Komen Charlotte, Patti, and you are all #MoreThanPink. ⇐ Thank you for giving to Komen Charlotte during GivingTuesday!